As crazy as it may sound, there are times when I just plain run out of ideas for what to cook for dinner. Yeah, I know, it’s hard for me to believe myself since I’m normally such a creative genius. I try to not cook the same things more than once, or at least not exactly the same as I have previously. I like to keep things fresh and new and keep pushing the envelope with my recipes and creations. Unfortunately, because of this attitude, I sometimes head into the 6:00 hour racking my brain for a new concept of what exactly I should cook. Last night was one of those nights. And as ashamed as I kind of am to admit, I turned to the label on the side of a Campbell’s soup can for recipe inspiration. And even more ashamed to admit that I was actually muy impressed with what I came across. Campbell’s really knows what they’re talking about when it comes to simple, easy meals. Now don’t get me wrong. I definitely did not follow their recipe completely. I still had to spice it up a bit and make it more Teeny-ified. And the results? Well, pretty darn fantastico! 1) Cook stuffing according to package directions. Set aside. 2) Steam green beans until crisp-tender, blanch and set aside. 3) Pre-heat oven to 375 degrees. 4) Mix condensed soup, cottage cheese, yogurt, garlic powder, onion powder, salt and pepper in a 2 qt. casserole dish. Add chicken and green beans and mix well. 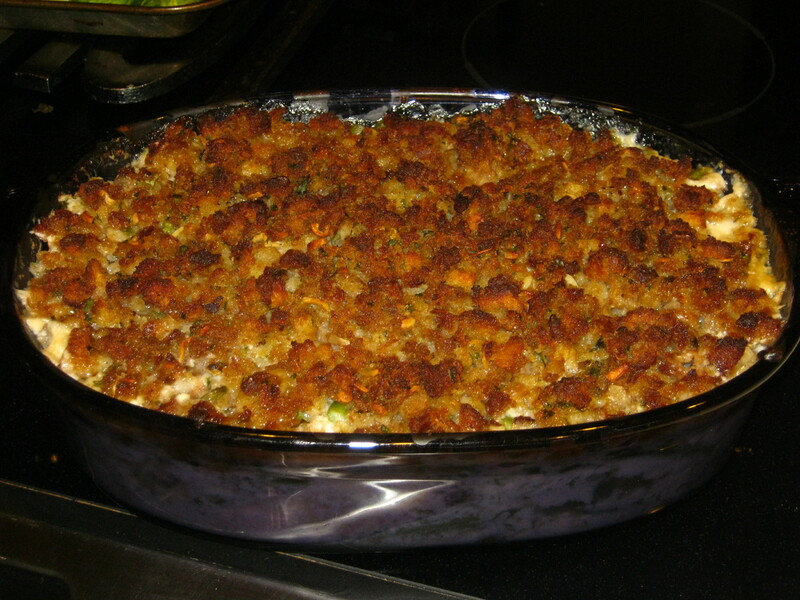 Top with the prepared stuffing. 5) Cover and bake 30-40 minutes or until chicken is cooked through. Remove cover and bake another 10 minutes or until bubbly and browned. 6) Remove from oven and allow to sit 5 minutes before digging in. Couldn’t be more simple than that and yet tastes absolutely delicious. I only wish all things in life could be that easy. Like trying to figure out how to change this darn cold, snowy weather into something sunny and warm. Maybe if I just close my eyes, I can imagine someplace just like that. Oh please, oh please, oh please…. Gotta love Campbells! It really sounds good with the way you teeny-ized it. 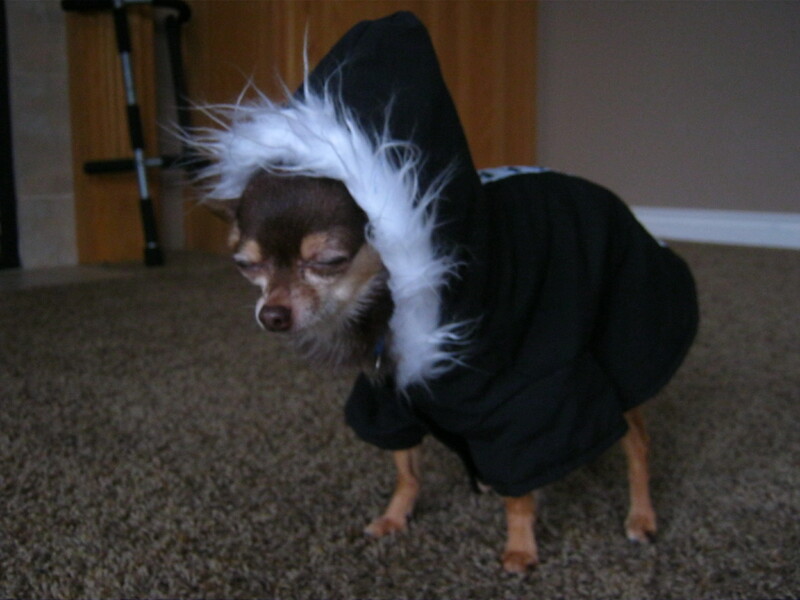 You look like teeny nanook of the north in your fur lined hooded parka. Too cute! Inspiration comes from anywhere! Even from Campbells’ soup. And if it tastes good…who cares? This looks great! I always have my hundreds of cookbooks to inspire me when I can’t come up with an idea for dinner, but sometimes it’s still hard! This sounds deilcious!